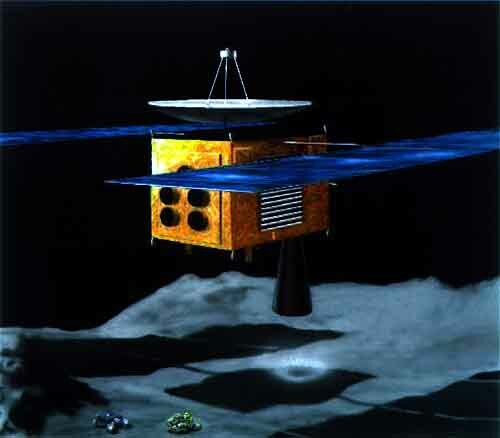 The ISAS MUSES-C spacecraft, to be launched in 2002, will execute the first asteroid sample return mission. 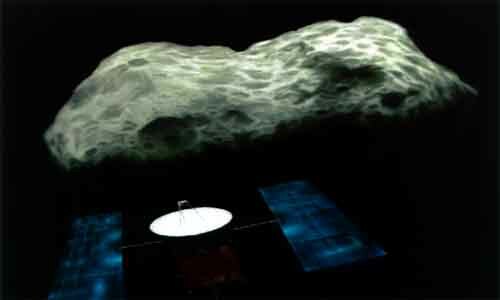 It is also planned that the spacecraft will carry a NASA-built rover to the asteroid. ISAS and NASA are planning to cooperate on the mission in several areas. NASA is providing a rover capable of in-situ scientific observations of the asteroid, Deep Space Network tracking, navigation support, testing of the ISAS return capsule heat shield at NASA's Ames Research Center, reentry targetting, and retrieval of the sample return capsule in the US. ISAS is providing transportation of the NASA rover to the asteroid and command and telemetry communications through the MUSES-C spacecraft and ground system to the JPL Rover Control Workstation on site at ISAS. ISAS also will transfer a portion of the returned asteroid sample to NASA. Both sides are providing science investigators for the MUSES-C and NASA rover instruments and for analysis of the returned sample. The four-wheeled rover will have a mass of approximately 1.3kg, with a body approximately 14cm x 14cm x 6cm high. 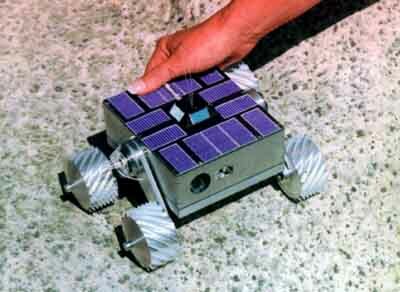 The 6.5cm diameter wheels have sensors to infer contact with the asteroid surface. The rover has solar cells on all sides providing 2.9W of power at normal sun incidence angles and has no battery. It has a radio on top for command and telemetry communications with the Orbiter-Mounted Rover Equipment (OMRE) on board the MUSES-C spacecraft above the asteroid. 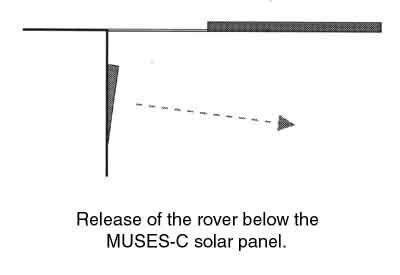 As the MUSES-C spacecraft approaches the asteroid to take its first sample, the NASA rover will be pushed away from the spacecraft by a mechanism in the OMRE at an angle of 10 degrees downward from the solar panels over head. The rover will take several minutes to fall to the asteroid. The rover wheels are mounted on struts which can rotate relative to the rover body, giving the rover the ability to orient its body in any direction relative to the surface for pointing and placement of its science instruments, or for righting itself if it lands on its back. 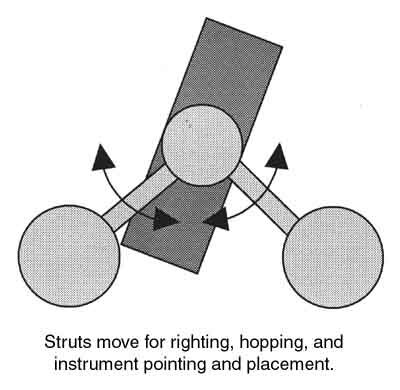 The struts also give the rover the ability to hop. The rover uses skid-steering to turn. The rover has three science instruments: an active pixel sensor camera with actuated mirror and focussing mechanism capable of taking close-up and panoramic images, an infrared point spectrometer with a 0.9 to 1.7mm spectral range, and a spectrometer capable of determining elemental composition of the asteroid surface. The rover itself can also be used as an instrument for soil mechanics investigations. During launch and flight to the asteroid, the rover is held to the MUSES-C spacecraft by the OMRE. The OMRE also contains the rover release mechanism and a radio for communications with the rover when on the asteroid surface. While the OMRE is on the side of the spacecraft, the OMRE radio antenna is mounted on the bottom of the spacecraft, where the asteroid is within its field of view. The OMRE forwards rover commands and telemetry between the rover and the MUSES-C on-board data handling system. Since the rover has no battery, it can only operate when the sun is shining directly on its solar cells during the asteroid day. The rover wakes up in the morning, communicates with the operations team at the Rover Control Workstation at ISAS through the OMRE and MUSES-C spacecraft and ground data systems, performs commanded operations and scientific observations, and falls asleep at the end of the asteroid day. Acquired data must be transmitted to the OMRE before each asteroid night. To plan the rover's asteroid day of activities, rover instrument scientists and the rover operations team will make extensive use of images and models of the asteroid derived from observations made by science instruments on board the MUSES-C spacecraft. The research described in this article is being performed by the Jet Propulsion Laboratory, California Institute of Technology, and is sponsored by the National Aeronautics and Space Administration, Office of Space Science. R. Jones, et al., "NASA ISAS Collaboration on the ISAS MUSES-C Asteroid Sample Return Mission," 98 IAA-L98-0506, Third IAA International Conference on Low Cost Planetary Missions, April 27 - May 1, 1998, California Institute of Technology, Pasadena, California.